Choose bladder control pads by absorbency level, thickness, and length. There are also gender-specific pads available. With so many options, you may need to try out more than one kind. Ask us for samples! 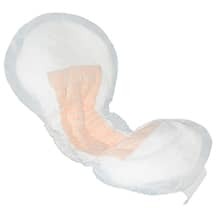 Most bladder control pads are for light to moderate incontinence. They are designed to be worn inside regular underwear. Bladder control pads have a barrier backing that prevents liquid from flowing through. Because of that barrier, they are not recommended for use inside another incontinence product, such as briefs (adult diapers).